You don’t want to sound as plain as “We are opening on 27th January, 2015” isn’t it? Perhaps you want to sound more powerful and committed as “We are near to your doorstep at 21st Parkinson Drive, CA, from 27th January, 2015”. Did you notice the difference between two messages? Imagine the impact they would create! 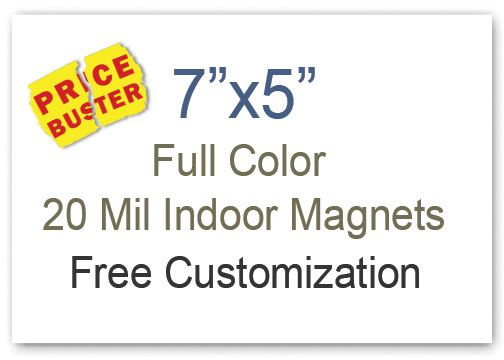 Similarly, you can create the right impact by seeking 7×5 custom magnets. They would lend creative flair to your announcements with full color printing. Do you know what makes a brand out of the business? A business becomes a brand if it can successfully connect with customers. If you are reading this blog, perhaps you want to evolve as a brand than remaining as a local business. Holiday wishes magnets help businesses to bridge gap with their customers and they take them closer to their targeted audience. People would always remember a brand, which contributed to their happiness by wishing them at the right time. Customized 7 x5 calendar magnets work perfect for businesses, which wish to indulge and influence their customers in a very polite way. Calendar magnets work great for all businesses and they offer great exposure for less than a penny – 365 days a year. Doesn’t that sound magnetic and amazing at the same time? 7x 5 outdoor magnets printed with bright logo and appealing business messages would buy attention, when your car is parked at traffic signal or passing through crowded areas. They may not build instant attraction, but regular viewing will help people to decide in your favor. Promotional posters are popular and so are poster magnets 5×7. People are getting fed up of seeing the same paper flyers and promotional posters in smaller sizes and they expect something magnetic. Posters printed over 5×7 magnets are perfect for building attention towards your brand. They can show up over refrigerator doors or working cabinets, with ease. People would retain full color personalized magnets as a refrigerator art as long as they wish. By seeing the dimensions, you would have understood that they are the specialty of online eCommerce store stocking made in USA magnets. Perhaps you can expect to save on bulk orders and on online design proof, art setup, shipping and full color printing because their prices are included within the product pricing. In addition, such online stores would offer you benefit of lowest price match guarantee. You can experiment with many other ways of value building by indulging customized magnets.